If there’s one thing I love in this world more than brownies it’s super gooey brownies. I make a batch of brownies every week because my daughter and husband LOVE them. We hate dry brownies… We prefer them moist and gooey. I make my brownies gooey but every time I make them my husband says he wants them even gooier! so one day I told him okay I’ll make you a batch of super moist and fudgy brownies and I’m sure your going to love them! If your on a diet I suggest you step away right now because you can’t just have one brownie your going to want to eat at least two or three squares, maybe even four. Ladies and gentlemen behold.. Super moist & fudgy brownies and yes yes chocolate ganache to top it off! These brownies are seriously the MOST gooiest brownies I’ve ever had in my life. They literally melt in your mouth. There’s chocolate on the inside and outside and I also used chocolate chips in the batter as well but that’s optional. Brownies are one of those things that you shouldn’t skimp out on and buy cheap chocolate. I suggest using Ghirardelli chocolate chips ( that’s what I used) because they are super rich and decadent. These brownies will remain super moist and fudgy even after cooling off and will stay that way for up to 5 days. Pour batter into prepared pan, smooth top with a greased spatula. 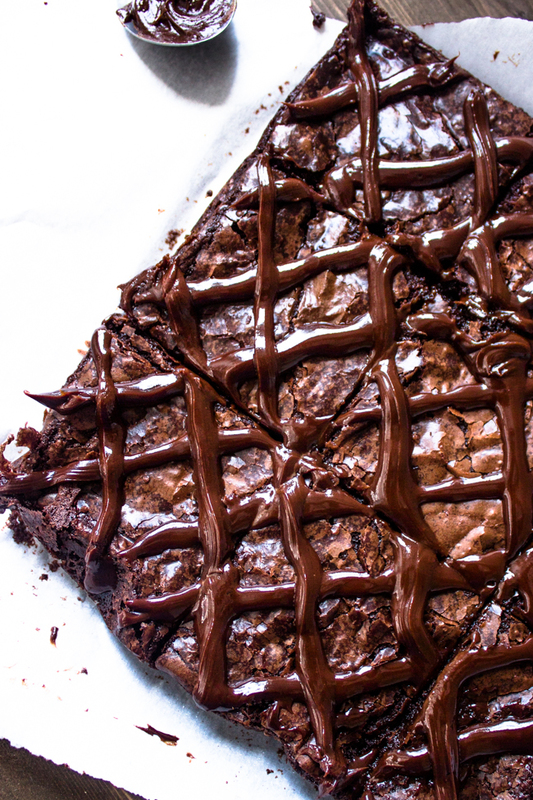 Bake for 20-25 minutes (20 minutes for gooey Brownies). Be careful not to over-bake. Let cool completely then pour ganache on top. Cut into pieces and serve or store. What is genache? Iv neverheard of it. To dark, Not what i expected at all, considering the feedback, i was hoping this was gunna be amazing, Dissappinted at my late night browiNes. we always make these ones. they are absolutely delicious!!! but we make a little change: we bought toffee/fzdge in the store and we put a lot of it on the top before putting it into the oven! and we only baked it for 15 minutes so the next day they stayed chewy and really moist. Would I be able to do without the brown sugar and substitute with more white? Would it affect the texture much? The white sugar increases the crisp texture while the brown sugar will make it softer. Can I double the recipe? Thank you. Can i use icing sugar instead of granulated sugar? Will it affect the brownies? What ingredient should I use to replace eggs? Will this Brownie be so moist without eggs too? I just made these brownies and boy are they chocolatey! They didn’t look like your picture though. I think it’s because I used a glass pan. The brownies cooked faster on the edges and remained gooey on the inside. Most decadent poet gooey chocolaty brownies o ever tasted! Thank you for the recipe! Best brownies ever! 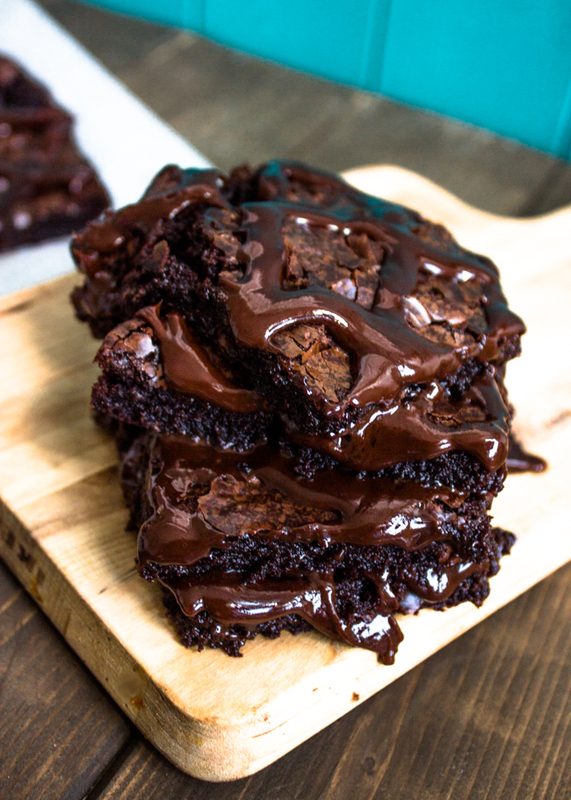 I’ve searched high and low for a good brownie recipe and these were So soft and gooey and taste amazing thank you for sharing this recipe I’m in brownie heaven! Rachel, I’m so glad you enjoyed them! 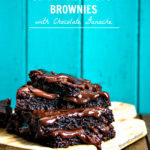 Just made these brownies now – they really are the gooiest choc brownies I’ve ever had! They have just come out the oven and are without the chocolate chips and ganache but still amazing! Definitely will make this a favourite as everyone at home loves them. Best when they are eaten hot! Hey I wanted to ask if they just need to whisk the eggs or beat them? I made this today, left it in for 20 minutes but it was very wobbly so left it in another 5 minutes. It was still quite wobbly in the centre but after leaving it out of the oven 5-10 minutes it got firm. Left it to cool completely then I cut it into 9 equal parts before pouring the ganache over and was very very nice. Thanks very much for posting. oooh ooh idea!!!! put the batter into a muffin tin, and pour half the ganache in the middle ish and bake them like that. once they’re cooled, flip them over and pour the rest of the ganache over them and they’ll be like mini molten lava cakes!!!!!!!!! Is it sweet enough even w/o the ganache on top or do we really have to add it to have the right amount of sweetness to the brownies? Thanks! Oh my look at all that ooey gooey chocolate! I’m instantly in love with these brownies! These are ridiculous and I love you. Bring it on!!!! Just looking at this makes me want a glass of milk. 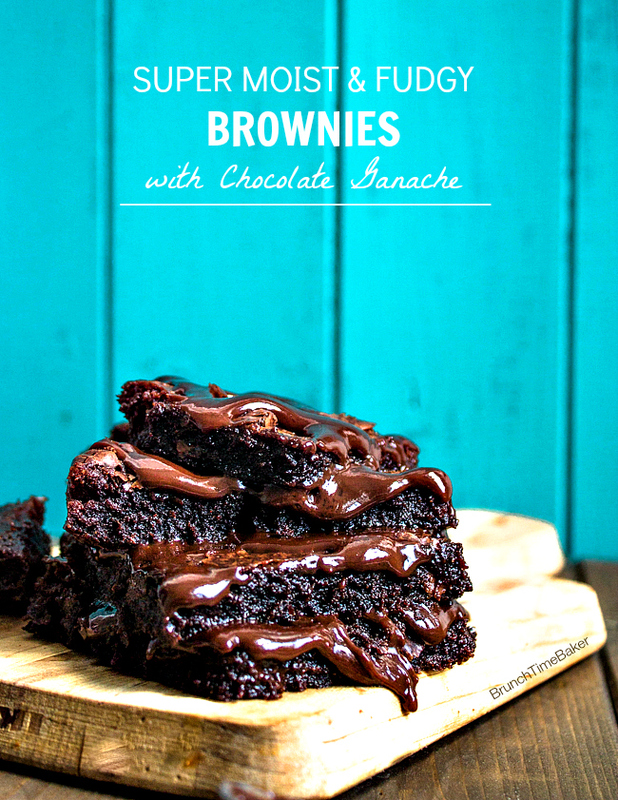 Holy guacamole this is the greatest brownie recipe I’ve ever laid eyes on! Look how ooey gooey they are!!! I WANT THESE NOW!!!!! Sorry for yelling. I’m just very enthusiastic for these hahaha. Pinning! Good golly! I think they are the fudgey-est, gooey-est brownies I have ever seen!!! When I looked at the first picture I said “Are you kidding me”. Girl, these are beautiful! I just want to eat them all! 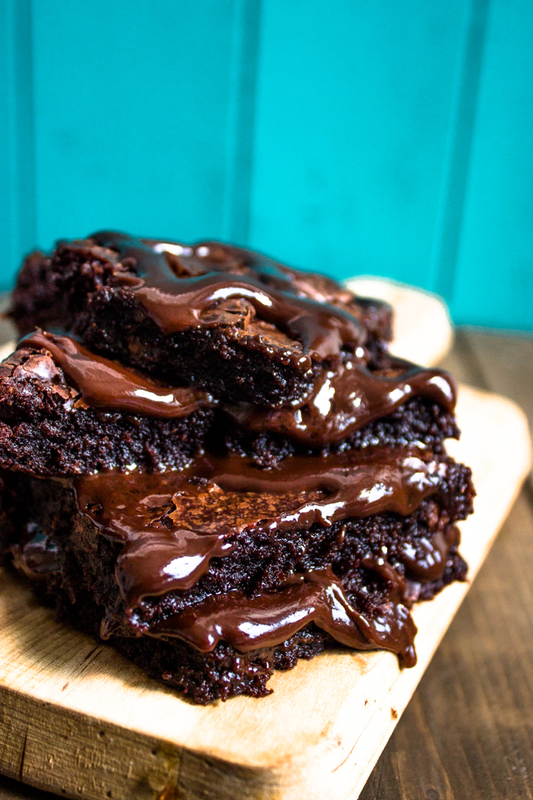 I don’t think I would be able to resist such moist and chocolaty brownies! Layla, my mouth is watering looking at all that chocolate! You got it right…these are the most gooiest brownies I have ever seen. Pinning! OH MY GOSH!!! Insanely decadent, I am totally in love! Yup. 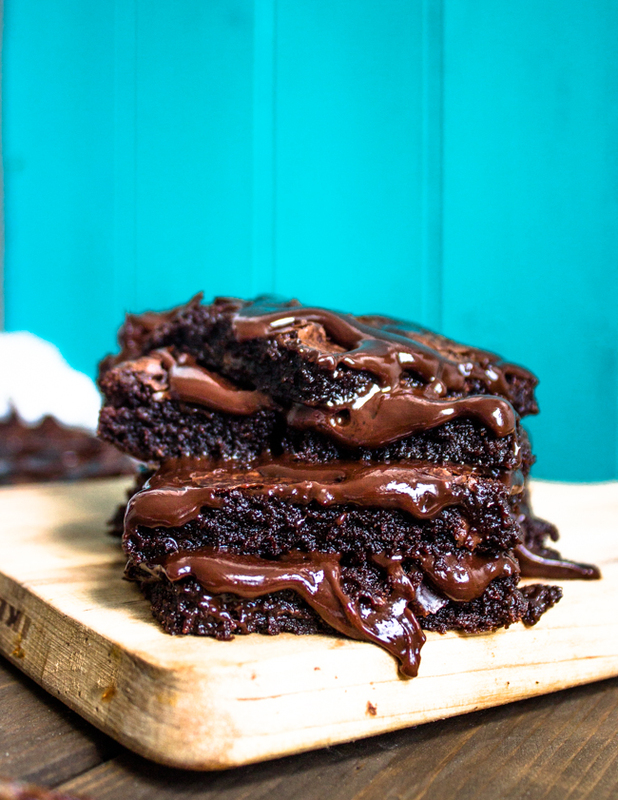 Definitely the most fudgy brownies I’ve ever laid my eyes on! These are being made as soon as possible. And pinned. Ohmygosh, these look so darn good! I need these brownies in my life.